Stay warm and dry without sacrificing protection or dexterity. Microfleece insulation keeps your hands and fingers comfortable in temperatures down to 40�F. 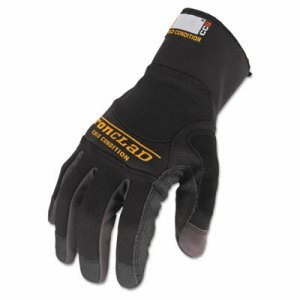 Duraclad� wear system provides 8X more abrasion resistance than normal synthetic leather; neoprene knuckle pads protect you from abrasions and impacts. AGT windproof, water-repellent membrane with neoprene water-tight wrist cinch. Handy synthetic-suede perspiration wipe integrated into the back of the thumb. Style: Work; Wrist Style: Neoprene Strap-Cuff; Material(s): Nylon/Fleece/Neoprene/Synthetic Suede; Thumb Style: Wing.